When visiting this East African gem, it’s easy to be overwhelmed by all of the possibilities. Should you check out the beautiful local wildlife? Cruise over to Lake Nakuru? Maybe try your hand rock climbing at Hell’s Gate National Park, or chat up the locals in Kiswahili? The options are as varied as the cultures in Kenya, but here are our top 10.5 picks to make sure you never forget your stay in Africa. For outdoor enthusiasts, a trip to Hell’s Gate is the perfect getaway. Just two and a half hours outside of Nairobi, the national park is perfect for rock climbing, hiking, horseback riding and even camping. If you and your family are looking to get away from the hustle and bustle of city life while on vacation, a trip to Hell’s Gate is the perfect solution. If you’re going to go to Africa, chances are you’ve at least thought about taking a safari, and the Maasai Mara game reserve is the perfect venue for those interested in seeing Kenya’s wild side. The park is located in the famous Serengeti, and is filled with elephants, zebras, wildebeests and many other creatures unique to Africa. Set on over ten acres of ranch land, Giraffe Manor is a hotel with a truly one-of-a-kind guest list. Human guests are often joined by giraffes, who stick their heads in through the large windows at meal times, and there are many other furry guests on the premise throughout the day: warthogs and bushbuck are common sights for travelers staying at Giraffe Manor. 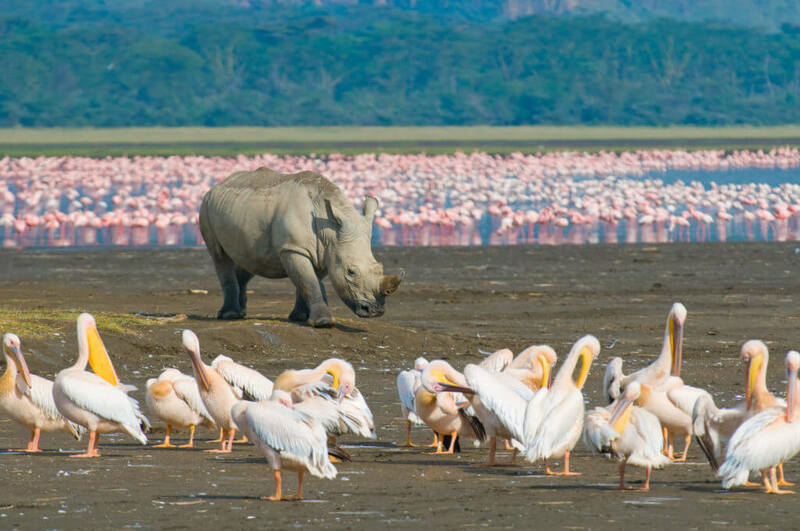 Lake Nakuru’s stunning beauty makes the trip to Kenya worth it all by itself. In addition to providing habitat to animals like flamingos and rhinos, there are over 400 species of birds native to the area, making the lake a very special destination for bird watchers. Once a farmhouse featured in the Oscar winning film “Out of Africa”, this museum offers a unique slice of Kenya’s cultural history. The house contains both historic artifacts as well as props from the movie, and gives a great sense of what plantation life was like in the Kenya of the early 20th century. Run by world-famous chef Harold Sena-Akoto, 45 Degrees Kitchen is a rich culinary experience guaranteed to satisfy the palate of even the most discerning foodie. Harold’s cooking expertise has taken him all over the world, from cooking for Arnold Schwarzenegger in California, to being recognized by Food and Wine Magazine in Toronto. The masterpieces of culinary delight are now available in Nairobi to those looking for a more upscale dining experience during their stay in the country. Interested in seeing lots of Mambas (crocodiles) while in Kenya? Well then look no further than Mamba Village. Only about 8 miles outside of Nairobi, this crocodile farm has over 70 Nile Crocodiles. Nile Crocodiles are one of the 3 breeds of crocodiles native to Africa, as well as being the biggest. Mamba village is great for a half day trip to see these fierce creatures up close. Coffee lovers and Africa go together like, well, coffee lovers and Africa. Human consumption of coffee actually began in Africa, and Java House in Nairobi is the perfect place to partake in the age old tradition, with a modern spin. Whether you want a latte and a burger, or a mocha with gourmet ice cream, you can make it happen at Java House. For those interested in a chance to sample the local coffee culture, and blend with some of the local Nairobians, Java House is a great site to visit. Baby elephants are adorable, and the elephant orphanage in Nairobi national park is the perfect place to help support them while basking in their cuteness. A visit to the trust helps support the great work that the staff does helping to protect endangered elephants, and you can even “adopt” an elephant for as little as $50 a year, and help ensure that these amazing creatures are around for generations to come. Kenya’s eastern coast opens into the gorgeous Indian Ocean. If you’re interested in white sand, and clear water, look no further than Kenya’s beaches. You can have a cookout on the beach, snorkel with the African wildlife, and play volleyball with the natives. A great way to relax for anyone taking their vacation in Africa. Lovers of local brews will be happy to know that Kenya’s local specialty, Tusker, is widely available in and around Nairobi. Stop by the local watering hole to try some, and hang out with the locals. Whatever you decide to do while in Kenya, we hope you enjoy your stay. It’s a beautiful country with diverse people and a rich history. Have fun!